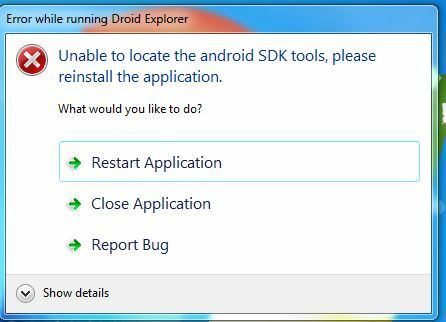 When I launch Droid Explorer I get an error message that states Unable to locate the android SDK tools, please reinstall the application. I installed the Android SDK tools from the SDK Download Page. Note: I am the lead developer of Droid Explorer. I am posting this question as I get a lot of bug reports for this issue. I am trying out using Android Enthusiasts as some what of a support Q&A for Droid Explorer. I will monitor any question tagged with droidexplorer. 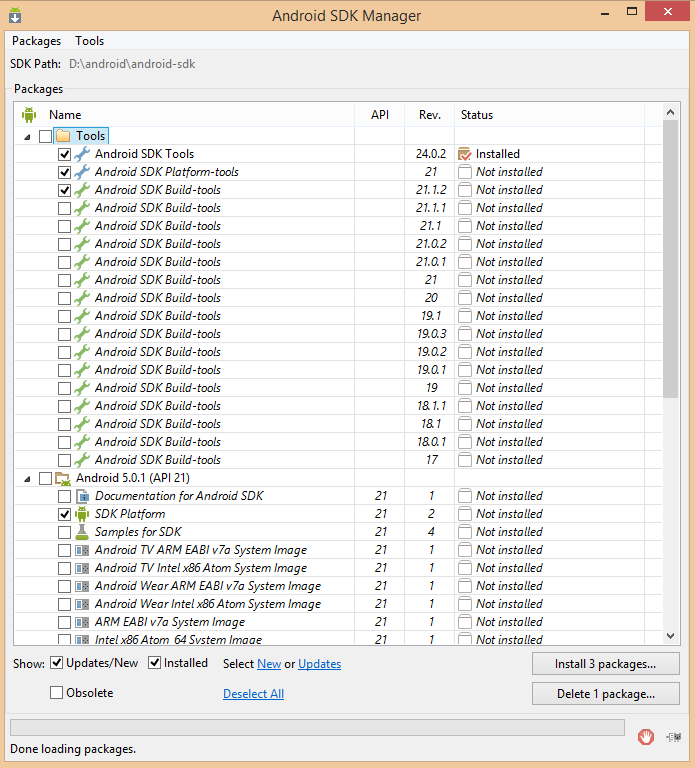 Droid Explorer, at its root, depends heavily on the Android SDK. It communicates with your devices via ADB. When Droid Explorer launches, it does some system checks to make sure the tools that it needs are accessible. These mainly include adb and aapt. There are some other tools that it uses, but these are the main ones that it needs to communicate. Unable to locate the SDK Version in 'HKLM\HKEY_LOCAL_MACHINE\SOFTWARE\DroidExplorer\InstallPath'. Try reinstalling the application. When you first install Droid Explorer, it will ask you for the location of your Android SDK. This value is stored in the Registry. Under this location, you will see a value called SdkPath. This needs to be the location of the root of your Android SDK. Make sure Droid Explorer is closed. Set the value of SdkPath to be the path to your sdk: My location is d:\android\android-sdk\. If you still are getting a registry SDK error after following these instructions, Ask a Question and add the droidexplorer tag. Unable to locate the SDK tools. Try reinstalling the application. This error usually happens when you install the Android SDK, but do not run the SDK Manager and add the required packages to the SDK. As a rule of thumb, you should follow Step 1, at a minimum, for what packages should be added to the SDK. If you still are getting a file system SDK error after following these instructions, Ask a Question and add the droidexplorer tag. It will look in 3 places for each tool that it needs to use. Older versions of Droid explorer looked in [SdkPath]/platforms/[latest-version]/tools/ but this path is no longer valid in the SDK.